The Simpsons creator Matt Groening is taking another shot at addressing the debate around Apu Nahasapeemapetilon. 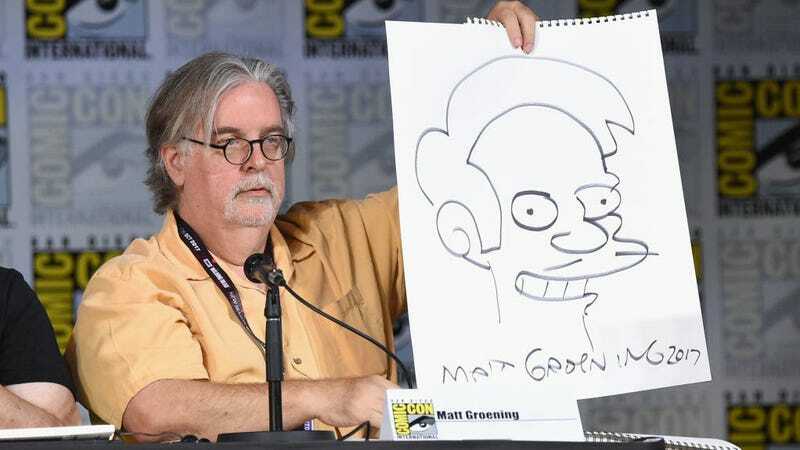 In an interview with The New York Times, Groening says he loves the character, and claims to “politically” agree with critics like comedian Hari Kondabolu, who brought concerns about how Apu’s stereotypical depiction affects Indian-Americans to the forefront with his documentary, The Problem With Apu. But he won’t say if or how the show will move forward with the character. Itzkoff then asks if Groening believes Indian-Americans like Kondabolu, Aparna Nancherla, and Kal Penn are “sincere in their beliefs,” to which Groening replies “Sure.” But while “my guess is I agree, politically, with 99 percent of the things that Hari Kondabolu believe,” he still doesn’t see Apu as offensive. We just disagree on Apu. I love the character and I would hate for him to go away. I am sorry that The Simpsons would be criticized for having an Indian character that, because of our extraordinary popularity—I expected other people to do it. I go, maybe he’s a problem, but who’s better? Who’s a better Indian animated character in the last 30 years? Groening makes a good point, one that he might not even realize actually supports Kondabolu’s critique. There is limited representation of Indians and Indian-Americans in Western pop culture, and that’s precisely why having the most prominent portrayal include a catchphrase like “Thank you, come again”—which the character might not utter much anymore, but you’ll find hard to remove from the pop lexicon—is hurtful and retrograde. Not to mention that he’s been voiced all this time by Hank Azaria, who is not Indian or Indian-American. The veteran voice actor has said he’s willing to step aside as the voice of Apu, but Groening hasn’t indicated if the show will change direction at all: “We’re not sure exactly how it’s going to play out.” But with seasons 29 and 30 already ordered by Fox, the show isn’t lacking for opportunities.